Lines of credit have been big business for banks and credit unions lately. With interest rates starting at 3.250 percent, it’s easy to get sold on bank-issued credit lines for financing renovations around the house or paying down debt. But before you rush to open that credit line, remember that lines of credit are variable-rate products and that they’re based on something called “Prime Rate”. As far as variables go in the mortgage world, Prime Rate is among the least stable. Prime Rate is a derivative interest rate, equal to the Fed Funds Rate plus 3 percent. Prime Rate rises and falls with the health of the U.S. economy — just like the Fed Funds Rate does. And this is why home equity lines of credit are priced so perfectly right now. The Fed Funds Rate and, therefore, Prime Rate, is as low as it’s been in history. It doesn’t take an elephant’s memory, though, to remember that Prime Rate was 8 percent-plus just 2 years ago. 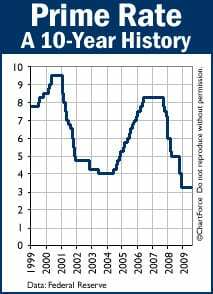 A few years before that, Prime Rate neared 10 percent. These are the facts that the banks and credit unions aren’t selling. Instead, they’re dangling low “start rates” as bait and waiting for homeowners to bite. In fairness, the credit lines are actually a good deal — where else can you borrow money for 3.250 percent? Long-term, however, the good deal can turn bad. If you the loan’s not paid by by the time the economy starts to recover, that 3.250 percent rate will climb and the math will fall out of favor. We’re on the precipice of that recovery now. So, for most people, getting cash via a cash-out refinance is the more prudent, long-term alternative versus opening a fresh line of credit. A cash-out refinance is when you refinance to a larger loan size and keep the difference as cash. You can use the money for home repairs, for debt repayments, for college tuition, or just for safe-keeping. It’s a lot of the same reasons why you’d want a line of credit, actually. The biggest difference is that you can lock up a mortgage rate for 30 years at today’s pricing. Both paths have pros and cons. There are specific reasons to take a HELOC just as there are reasons to go cash out. Just remember that banks and credit unions aren’t selling 3.250 percent, per se — they’re selling “Prime Rate” and Prime Rate is variable. If you’re unsure of whether HELOCs or cash-out refinances are best for you, or want to know today’s available rates, call or . We can talk about your situation and find a plan that works.